We have much to be proud of at Alabama State University. Our institution stands on a rich legacy of perseverance, progress and promise dating back to our founding in 1867. We offer world-class academic programs taught by talented, caring faculty, and our growing campus boasts a number of state-of-the-art facilities to enhance our living and learning environments. Still, our most prized assets are you – the students who are proud to call ASU home. At ASU, we take seriously the privilege of educating tomorrow’s leaders today. 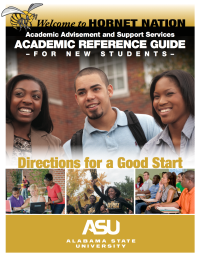 We strive to provide you with top-notch resources, programs and services to help you make the most of your ASU experience.